The year 1995 was the pinnacle of Mariah Carey’s commercial success. “Fantasy” had become the first song by a female artist to debut at #1 on the Hot 100 and only the second one in the history of Billboard (the first was Michael Jackson’s “You Are Not Alone” a few weeks before); the Daydream album had debuted at #1, which was also a first for Mariah. Mariah had an idea in mind for the song, which she discussed with her writing and producing partner Walter Afanasieff, and the theme was the pain for the death of a loved one. When she first decided to arrange a meeting with the group, she had already completed the first verse and the chorus and when she played them what she had, Nathan Morris was very surprised. Boyz II Men had recently lost their road manager and Nathan had started writing a song that fit perfectly, both lyrically and melodically, with what Mariah and Walter Afanasieff had begun to write. “One Sweet Day” basically was born by merging the two songs together, it was almost as if the collaboration was just meant to be. Its universal theme and the uplifting message resonated with the public and made the song the biggest hit of Mariah’s career. Not only did the song debut at #1 upon its commercial release in November, but it remained at the top of the Hot 100 for 16 consecutive weeks, from December 2, 1995 to March 16, 1996. A record that many songs have come close to almost match but not break, as recently as this year. 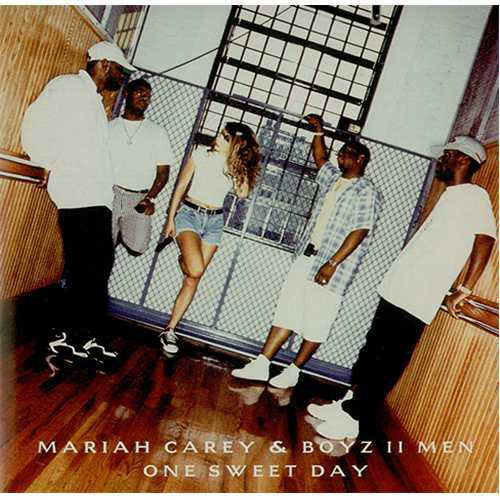 “One Sweet Day” topped the Pop, Adult Top 40 and Adult Contemporary charts and the CD Single was certified 2x Platinum for sales of over 2 million copies. In 2000 Billboard declared it the Song of the Decade (a feat Mariah would achieve once again 10 years later), while Mariah herself was crowned as the Artist of the Decade. The music video documents the recording process of the song. Mariah has explained that they decided to film it while recording because they were afraid of conflicting schedules that wouldn’t have allowed them to get together for the video shoot. That is, in fact, one of the reasons why they haven’t performed the song together more often since its release. They first sang it at Mariah Carey’s Madison Square Garden concert in October 1995, which was broadcasted on TV. “One Sweet Day” was also the powerful opening performance at the 1996 Grammy Awards, where it was nominated for Record of the Year and Best Pop Collaboration with Vocals (among the 6 nominations Mariah received that year). Later performances have been at the BET Christmas Special in 2001 and a surprise appearence during the final American stop of Carey’s The Adventures of Mimi Tour in 2006 at Anaheim, which was filmed and later released on DVD. In general, both Mariah and Boyz II Men avoid performing the song on their respective tours, despite being their biggest hit single, which has probably contributed to the song’s decrease in popularity with the public over the years. However, the song continues to be recognised in singing competitions such as American Idol and X-Factor, where it has been performed by the constestants on specific themed weeks. Mariah’s fans usually feel attached to “One Sweet Day” because of its lyrics or because of nostalgic sentiments, both for personal experiences of loss or simply as a celebration of what the song has meant for Mariah Carey’s career. Many tend to prefer the two versions that were included in the CD Single: the acapella version or the Chucky’s remix, which feature different vocal arrangements and smooth out the production of the original, giving it a sweeter vibe instead of the epic/full sound of the album version. While it would have been nice for it to have gotten more critical recognition, if only for what this superstar collaboration meant in the musical landscape of the 1990s, “One Sweet Day” will always be remembered for having made history with its commercial achievements and for that it is worthy of being celebrated in this important moment of Mariah Carey’s incredible career.